UE’s Wenlie Maulas the Mens UAAP 800m champion will try and make it his third year in a row as champion with a personal best time of 1.53.84 (4th at ASEAN University Games In Thailand last year). Perhaps if he really guns for it and has a good day purged of injuries he may eclipse the UAAP Record in the event set by Nelbert Ducusin (FEU) 1.54.2 in 2008. Certainly a realistic target if he decides to peak for this meet. Maulas who succeeded UST Ben Alejandrino as 800m Champion, who in turn had succeeded Ducusin carries on the legacy of middle distance runners at the UAAP. Perhaps he can rewrite himself in UAAP History this year. Wenlie Maulas (UE) raises his hands in victory to win his first of two titles in 2010, could be gunning for the UAAP Record this year? Maulas who has had an injury most of the season however suffered a shock defeat at the Uni Games to Jordan Paul Billones (UST) who after finishing bronze and silver the last UAAP perhaps has waited long enough to finally claim the gold from the champion. With most of the action taking place in this event at the NCAA it is really hard to say who else will figure as most of Maulas and Billones key rivals have already graduated. Maulas also looking at making it a double again in the 1500m. His best time of 4.00.31 was clocked a year ago. So it is just a matter of holding on now for the veteran. No one else this year in UAAP has ran under 4.04. 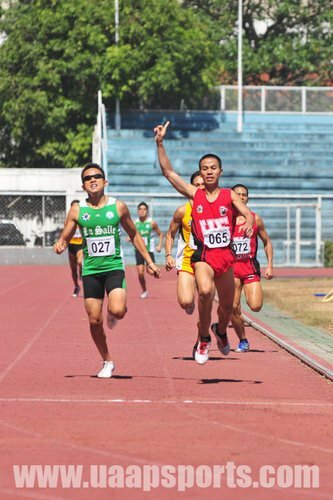 But last year Ernie Opiana and Richard Salano both of UE both ran 4.03 and they were also silver and bronze at UAAP. In the Womens 800, Hurdler Josie Malacad (FEU) is expected to dominate having won last year in 2.15.7, with training partner Keizel Pedrina (UST) 2.17.6 getting silver last year and FEU Mary Ann Delacruz (FEU) 2.19.3 the bronze. Outside chances for the minor medals include UST new recruit Jilla Delarosa 2.19.5. In the 1500m defending Champion Mary Ann Dela Cruz may have some strong opposition from the some of the new provincial recruits especially the ones from UST which may make it difficult for her to defend her title. Delarosa and Malacad if she decides to run this event are both expected to challenge Dela Cruz with all 3 girls running just under 5 minutes for the event. Firstly I would like to note that these rankings are based on performances from the 2010 and 2011 period. It doesn’t take into account any new rookies and acquisitions I’m unaware of, injuries, post season improvements, and athletes who have graduated or are no longer part of the team which I do not know of. Hence it serves as a rough guide based on the statistics I have gathered from important meets. Time Trials not included as not official results. As mentioned in my last article (sprints review of UAAP 2012) slight change of plan. Initially I was going to write a review of Hurdles but I will be working on this with Hurdler49 (aka. Joboy Quintos). Part 2 covers the Middle distance mens and womens. The 800m arguably the toughest event of the track. Having ran this the prolonged pain of the last 200m is a reminder of why I opted not to run this distance ever again. This entry was posted in 05 UAAP News and tagged ASEAN University Games, Athletics, Ben Alejandrino, Ernie Opiana, Jilla Dela Rosa, Jordan Paul Billones, Keizel Pedrina, Mary Ann Dela Cruz, middle distance running, Nelebrt Ducusin, Philippine athletics, Philippine track and field, Richard Salano, UAAP, UAAP athletics, uaap records, UAAP track and field, UST track team, Wenlie Maulas. Bookmark the permalink.